Traditional storage can fall short of the mark for today's enterprise. As your organization moves into new, next-generation use cases such as cloud, analytics, big data, or media streaming, you need a storage solution that is economical to scale as data volumes grow. But traditional storage systems add fixed amounts of capacity with limited bandwidth, requiring a large, up-front capital expense ...and making scalability difficult. With scale-out storage and standard, off-the-shelf servers, adding capacity and performance can be a smaller, incremental expense. Your organization can scale one server at a time. Cloud service providers and forward-looking enterprises are adopting this model, using open-source software designed to run on standard server hardware. 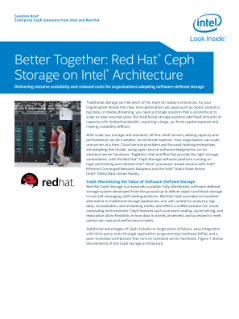 Together, Intel and Red Hat provide the right storage combination, with the Red Hat Ceph Storage* software platform running on high-performing and reliable Intel® Xeon® processor-based servers with Intel® Ethernet Converged Network Adapters and the Intel® Solid-State Drive Data Center Family.